This is the first voice-interactive coffee maker that asks, "Would you like to set the clock or set the coffee brewing time?" and operates in response to your verbal commands. Simply saying, "Set the coffee brewing time," or "Set the clock," will prompt the machine to reply, "Please say the time, including AM or PM." It uses an advanced voice recognition system to identify any time of day you speak, eliminating the hassle of fussing with buttons. The included reusable, dishwasher-safe plastic filter is specially designed to allow the water to thoroughly saturate coffee grounds, maximizing the richness and aroma of coffee. The coffee machine brews up to ten cups at once and allows you to remove the carafe during brewing to pour a cup. Portable CCTVs for magnifying menus, prescription bottle labels, etc. still cost around $1,000, out of reach for many folks. Eye Glasses, a $3 iPhone app performs basically the same function by taking the camera feed and bumping it up as much as 8 times magnification. Eye Glasses is for the visually impaired, whether aging with failing vision or plain short sighted, squinting spectacle-wearers. Hold the iPhone in front of some hard to read text and the app takes the camera’s feed and makes it bigger: up to eight times bigger! It works with any iPhone, but the close-focusing 3GS will give the best results. Click this link to learn more about the iPhone app Eye Glasses: http://www.wired.com/gadgetlab/2009/09/eye-glasses-turns-iphone-into-magnifier-for-oldies. The following information comes to us from the Tails Gone West blog and is reposted for your convenience. Seriously. 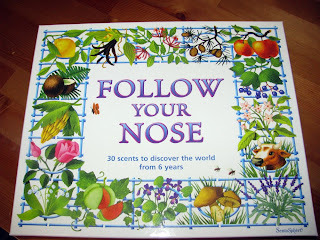 You can't win this game if you don't use your sniffer! We were quite excited to get this game, as it's the very first board game that puts Christopher and the rest of us very nearly on equal footing when playing, and requires almost no adapting -- I just need to put the braille words on the cards. Message: I am looking to help a friend with learning Braille. I am totally blind, and have known it all my life it seems, but my friend is having trouble recognizing the dots. My idea to assist him is to use a peg board to make letters and shapes, because I remember doing similar activities when I was in elementary school. Where might i be able to find something like this? I picture a light bright without the light. Any suggestions you have would be appreciated. location: Ohio I think you are on the right track with your thoughts on how to teach your friend braille. The American Printing House for the Blind has a device that you may have used as a child. Swing Cell CompactSimilar to the Swing Cell, but without the base. Smaller and lighter than the original. Helps students understand the relationship between the braille cell and the keys on a braillewriter. Internal storage of pegs. Recommended Ages: 5 years and older. by Pauletta Feldman and Mary Ann Reynolds (1996) Start early getting to know all the people who will eventually be in a position to serve your child. Network! Start sharing your dreams and let them get to know your child. Then, when you are in a position to work together, there is a good basis for open communication and teamwork. There aren’t a lot of surprises for school personnel and they have advance time for planning programs to meet your child’s needs. Recognize that school personnel are people too. Good educational outcomes for your child are not just dependent on you knowing your child’s educational rights but also on you practicing good people skills. Be willing to negotiate and make compromises or tradeoffs. Realize that the tradeoffs you make today can be made up for by different program options in the future. First and foremost, you need to determine your face shape. “There is one rule when it comes to choosing the ideal frames for your face: Contrast the frame shape to your face shape,” advises Rene Soltis, an optician and a spokesperson for the Vision Council of America. So if you have a round face made up mostly of soft curves, you’ll look best in angular or square frames. And if you have a more narrow or angular face (resembling a rectangle or a square), opt for rounded styles. If your face is heart shaped, try something delicate, like a wire or rimless style, to balance the narrowness of the chin. And for those with an oval face, you are free to experiment, since practically any style will suit you. The key is to avoid duplication of shapes, because contrast is what creates emphasis and balances your features. The Lighthouse, in partnership with the Smith Kettlewell Eye Research Institute, offers tactile maps with Braille legends for visually impaired travelers and pedestrians. This is also a useful tool for mobility instructors. TMAPs cover one square mile centered on a specific street address, or intersection with a marker to show the position of the address. To request a TMAP, send an email (Subject: TMAP Request) to info@lighthouse-sf.org and provide a phone number and street address or intersection. You can also call The Lighthouse at 888-400-8933. Love to watch documentaries ? Bodocus is a website where you can freely access and stream over 650 documentary movies. No registration required, just select your movie and watch. Categories include: Anthropology, Biographies, Business, Environment, Foreign, Politics, Health, History, Lifestyle / Society, Mystery, Religion, Science, and Technology. Click this link to visit http://www.bodocus.com. FreeDocumentaries is another site that aggregates and categorizes online documentary movies in one place. Choose and stream any documentary for free. Browse films by theme, geographical region, or alphabetically. Get notified about new film additions. Choose between different video sizes (Small, Medium or Large). If you've ever tried uploading MP3 files to YouTube, you know that YouTube does not support this feature directly. Until now the only way to upload the MP3 file to Youtube was to convert it into a video file first and upload it as a video file. Now you can avoid doing this and save time by using a service called Mp32Tube. By using this online application, anyone can easily upload MP3’s to Youtube.com without converting anything. Go to Mp32Tube and select an MP3 file and the image that you want to use as a thumbnail on YouTube. Next choose whether you want it to be uploaded to your YouTube account or an MP32Tube account. Click on the “upload” button and wait for the sharing URL. It might take a few minutes before the file becomes accessible and playable online. Currently, Mp32Tube is free to use. Premium accounts with more features (multiple image and file upload, no waiting times, faster speed) are likely to be introduced in the future. Are you lost with all the new technology and new Internet terms you stumble upon while browsing the web? The Webopedia is the place to look them up. It is an online dictionary of technology related terms and abbreviations including tech acronyms, Internet slang and other terms that were born with new technology. You may search for definitions using the search engine or browse terms by topic like Graphics, Mobile Computing, Open Source etc. Term definition also includes a short history about the term and a list of related terms. People who use their eyes to acquire information about the world are called sighted people or "people who are sighted". Legal sight means any visual acuity greater than 20/200 in the better eye without correction or an angle of vision wider than 20 degrees. Sighted people enjoy rich, full lives working, playing and raising families. They run businesses, hold public offices, get arrested and teach your children! How do Sighted People get Around?People who are sighted may walk or ride public transportation but most choose to travel long distances by operating their own motor vehicles, usually one passenger to a car. They have gone through many hours of extensive training to learn the rules of the road in order to further their independence. Once that road to freedom has been mastered, sighted people earn a legal classification and a drivers license which allows them to operate a private vehicle relatively safely and independently. Windows users like to use Windows Live Messenger (formerly known as MSN Messenger) for instant messaging because the application comes with every installation of the Windows operating system. Windows users can conveniently use it without searching for other IM programs. There are some who hardly use Windows Live Messenger and find it an eyesore in their computer's system. If you are one of them, the MSN removal/uninstall tool WLMUninstall could be something of interest. WLMUninstall is a simple and standalone program which doesn’t require any installation. Users download the tiny program and execute the file. Click the “uninstall” button and the free MSN uninstall tool will remove Windows Live Messenger or MSN Messenger completely from the computer. The LazLight was designed specifically for people with low vision, aging eyes and Macular Degeneration. This is not an ordinary reading lamp, but rather, a serious lighting tool. This hand-crafted lamp produces extremely high levels of light that were previously unavailable to the public. It works like a spotlight on your reading surface, significantly increasing contrast and color without any eye damaging “blue light hazard.” With its unique dimmer switch and gooseneck, the light can be easily adjusted to best fit the user’s needs. LazLight inventor Ronald Lazarus has been in the lighting industry for over forty years. He has been involved in all phases of the lighting industry: as the owner of a lighting store, a lighting fixture factory and a lighting agency. He is accepted as an expert witness in general lighting in court. The “LazLight” is made in the USA and comes with a three year manufacturer’s warranty that covers all parts including the light bulb. Large, bright symbols to place on objects in a room, and identical, smaller symbols for maps Recommended ages: 6 years and older. Click this link to purchase Maps Represent Real Places, Map Study I: Complete Kit. American Printing House for the Blind, Inc. Program designed for young beginning braille readers, preprimer through third reader level. Word recognition is taught through tactual memory, phonological skills, and syntactical skills. Contains a variety of materials for each level, including: textbooks, posttests, worksheets, and teacher's editions. Recommended ages: 5 years and up. Note: Some braille versions of Patterns teacher's editions available from APH are vacuum form books that were transcribed by the Braille Services Guild of California. Complete kits include only the print versions of the teacher's editions; braille teacher's editions must be ordered separately. Patterns: The Primary Braille Reading Program: Scope and Sequence Chart (overview)This is an overview of Patterns: The Primary Braille Reading Program, a complete program designed specifically for young beginning braille readers, preprimer through third reader level. Multiple appetite items featuring texture, color, and sound for use in the routines WARNING: Choking Hazard -- Small Parts. Not intended for children ages 5 and under without adult supervision. Since the first Prison Braille Forum, which was held in conjunction with the 2001 Annual Meeting, the professionals working with braille production programs in correctional settings have identified the need for a directory of established programs. APH published a directory in 2004 and has recently updated information and released a 2009 edition. This compilation of data on existing prison braille programs will help programs market their services, and it will enable individuals and agencies in need of braille materials to identify and contact potential sources. In addition, anyone interested in starting or improving a program can contact experienced professionals through this directory.A limited number of print copies are available upon request, and the document will be available soon as a free download in a print or braille format from the APH website. Check the website in coming weeks for its electronic release.